Herman Wallace, Angola Three: Solitary confinement is horrible and inhumane. Solitary Confinement Is Horrible and Inhumane. Why Is It Still Legal? In this file photo, an inmate holds onto a fence at the Louisiana State Penitentiary. Wallace was released from prison last Tuesday, after a judge overturned his conviction. His death three days later—his cancer was very, very advanced—has prompted a re-examination of the efficacy and humanity of long-term solitary confinement. According to the most recent data from the Bureau of Justice Statistics, the United States holds about 81,000 prisoners in solitary confinement at any given moment—slightly more than the population of Gary, Ind. Prison officials across the nation have long defended solitary confinement as a necessary corrective tool. But a growing number of critics have condemned the practice as cruel and unusual punishment—and, what’s more, as ineffective. 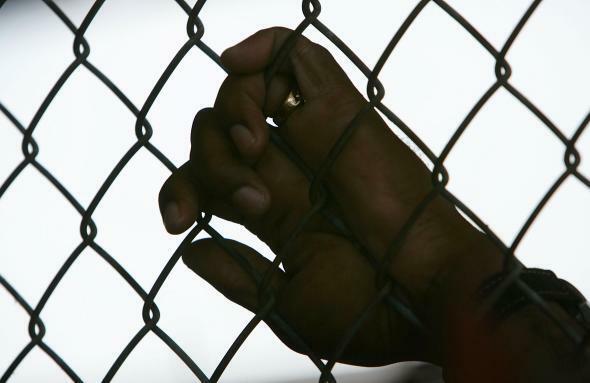 The United States invented systematic solitary confinement. In the 1820s the Pennsylvania-style prison system kept inmates separate and silent, confined to small cells where they were expected to spend their days contemplating their sins. At the time, the system was considered extraordinarily progressive, given that it did not involve mutilating or executing prisoners for their crimes. It was also quite ineffective, as isolated prisoners tended to go insane. Over time, solitary confinement became a punitive measure, imposed as a response to transgressive behavior. Solitary confinement is now used as a way to separate dangerous or disruptive inmates from a prison’s general population, and occasionally to protect inmates whose lives might be in danger. Isolating troublemakers makes the rest of the facility safer and more manageable, the thinking goes. This mentality has led to the construction of dedicated “administrative segregation” wings and “supermax” prisons that exist to abet the long-term solitary confinement of prisoners. While the conditions of modern solitary cells vary by facility, they are generally small, narrow spaces no bigger than a bathroom to which inmates are confined at least 22 hours per day. They generally feature overhead lights that never dim and minimal interaction with other humans. This might not sound all that bad to you, and, indeed, lots of prison movies feature characters who breezed through their stints in solitary because they were mentally tough, and occasionally because they had a baseball to keep them company. But a short stint in “the hole” can wreak long-term psychological havoc. So why is solitary confinement still so popular? For one thing, legislators have had little incentive to reform it. The public doesn’t care about what happens to prisoners, and, thanks to various felony disenfranchisement laws, most legislators don’t really care, either. (This isn’t always true; some legislators have indeed called attention to the problem, but they’re in the minority.) For another thing, lots of prison officials defend the practice, saying that isolating truculent prisoners helps protect the safety of staffers and other inmates. We should not discount prison officials’ opinions on how to effectively manage and maintain order in their facilities. But neither should we let their words be the final ones. In a statement issued today tied to Herman Wallace’s death, the United Nations’ Méndez said that “the use of solitary confinement in the U.S. penitentiary system goes far beyond what is acceptable under international human rights law.” Long-term solitary confinement is inhumane, and our continued reliance on it as a viable detention strategy is an international embarrassment.